Check Regal Poker for Latest Poker News, tips and more. The pot that all active players have contributed to and that all active players are eligible to win, occurring in a situation where a side pot is created. Separate showdowns occur for each side pot and for the main pot, and players not eligible to win a particular pot do not participate in the showdown for it. Regal Poker is the Poker Online website, visit us and check out our promotions we offer you the best online poker bonus. In situations where there are side pots, the main pot is the one in which all bets are matched by all players involved in the hand. Also known as “center pot”. 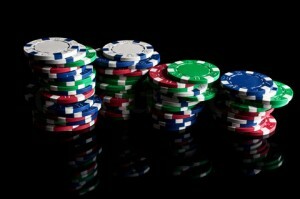 The term “main pot” is usually heard only when a player is all-in. Players are only able to win up to the amount they have in front of them. If they are not able to match a bet because they are all-in, then a side pot is created. Players that contribute to that side pot are eligible to win that pot as well as the main pot. Say for example a player only has $1,000 in front of them and they are playing in a Limit Hold’em tournament with blinds of $500-1,000. If the pot was limped in preflop, then all the money would go into the main pot. The player that only had 1k in chips at the start of the hand would be all-in and wouldn’t be able to wager any more chips. In turn, he would not be eligible to win any more chips. All subsequent action would be put into a side pot and all players that contribute to that pot have a chance of winning. If multiple players go all in, multiple side pots will probably have to be constructed. Each time a player does not have enough chips to cover a bet that they are facing, they will be all in, and an additional side pot will be created. Each all in player may only win the pot or pots that they have contributed to. To eliminate confusion, when the hand is over, the winner of the last side pot is resolved first. The dealer always awards all side pots in reverse of the order in which they were constructed. The winner of the center pot is resolved last. Looking for best online poker game website? Follow us and check out our promotions we offer you the best online poker bonus. ADDITIONAL INFORMATION: Example: In a particular game Player A has $4, Player B has $20, and Player C has $20. Player A goes all-in with $4, Player B raises to $11, and Player C calls for $11. Because Players B and C have bet more than player A can call, a side pot is created. The side pot is the amount that B and C bet that was not matched by A: $7 each for a total side pot of $14. The main pot is the money that was matched by all players who are still playing: $4 from A, $4 from B, and $4 from C, for a total main pot of $12.